Sorry this one’s late! But it’s still Saturday so I kept my pinky promise. Happy October! It’s my second favorite month, and I’ll try to brew up some spoooooky goodies for you guys over the next few weeks. Unless…?! The suspense is killing me and I don’t want to die!! Lookit that sunset in the window. Lookit. I did lookit the sunset and I think it is marvelous. I like drawing sunsets! And improving at art. It is! A little too good, actually. I keep being busy with good things. Are you sure you weren’t Cyril in this dream? I really like the colors you have out the window, they are very lovely! Lord Skaerva looks more and more annoyed with each panel. Presumably his face is obscured in the penultimate panel to keep us from spontaneously combustion from the sheer fury. Captains say “UNLESS!” all the time. Oh hey that’s a map back there. That might be a portrait of the captain behind him? The hat looks different though, and it’s hard to tell when the painting doesn’t have any spots on it. It could be anyone, even the PREVIOUS CAPTAIN who is actually going to be the boss of the next plotline! Lorelei just looks so happy in every panel. What actually HOLDS UP the captain’s hat? Does he have STRONG floating eyebrows like Skærva does? There doesn’t seem to be anything connecting to his head other than perhaps his eyelids. AUGH WHAT IS IN THE CHEST I MUST KNOW. Is that Bread cut like a fish on the Captain’s plate? I see two slices of lime, a slice of lemon, two slices of cheese, and bread. Are salamandrians omnivorous, and for some reason require fruit to fight off scurvy despite having evolved underwater? I like how Derk is the only one who has finished their food. As for the portrait… well, Kagey, you’re smart. You pay attention. I trust you can figure it out- look really closely at the hat, and who in the story wears that kind of hat, and who Goldgills might admire or want to avenge. It’s not bread. It IS fish. That’s what salamandrians natively eat (and they don’t get scurvy but the citrus is for flavoring, and it’s good to have on hand anyway because the humans and Lurkins on board totally could get scurvy). To be fair, flish eat less-sentient fish too, that’s just the food chain. Although some have become vegetarians over time. When has another Salamandrian shown up in the story? My memory fails me. The Admiral who was Betrayed back during the War by his Flish Vice Admiral, you remember? From the Backstory page? Indeed. But not quite so many capitalized terms are necessary. Or the “trader” that Lorelei scared away by asking where the jail was? Now why would Goldie have a portrait of that guy? Maybe they’re brothers. I actually kinda like this headcanon. One of them went into piracy on the high seas and the other makes a living on the black market. I enjoy how quick Skarva was to shut down the bard about telling the story. WELP it’s too bad the shark-ler don’t give a crap. I’m kind of surprised Skarva* didn’t just leave the room and let Cyril sing to the pirates. Is that to horrible even for him? *I really wish I could type umlauts. Also Skärrrva. I love it and I can’t believe it took me this long to notice it. It is as easy as alt-0228. 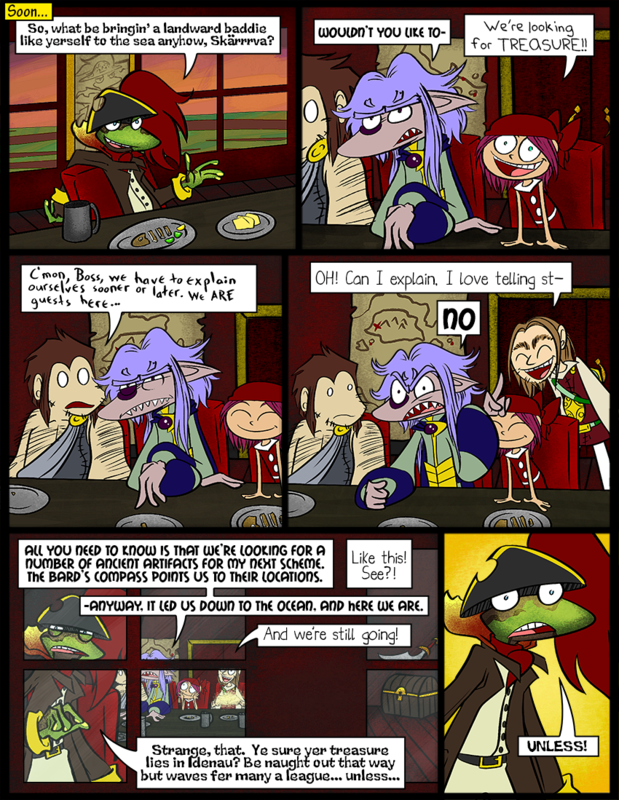 The feather in the captain’s hat threw me for minute; I thought the background in the last panel was on fire. Whoops. Goldgills turns around to find Skärva’s fury has caused his cabin to erupt into flames. Must have been that “Unless!” Skärva cares not for dramatically incomplete sentences. I sea whatcha did tharrrr. I swear that the Salamandrian in the portrait behing Captain Goldgills is the Salamandrian that was betrayed by the Flish in the “War of Idenau” story. I too was alarmed. This is the most sense Captcha has ever made. Is it the same power that keeps Skarvas’ second set of eyebrows near his face that is allowing the pirates’ hat to not fall down in front of his eyes? Or is it just a magic hat? I like to think it’s gently resting on his eyeballs.